So, You're a Writer...: Casting Call! As I mentioned last week, I'm co-hosting a weeklong bloghop with two ridiculously talented women: Melodie Wright and Lisa Regan. 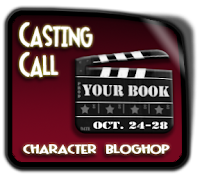 Simply put, it's your chance to show off your characters, for all of the blogosphere to see. Fact: This bloghop was Melodie's idea. She was inspired by a post Anita Grace Howard did using photos to describe Splintered's antagonist, Morpheus. Cool, huh? Book trailer - You've seen them online, right? This is the perfect excuse to try one of your own! For an example, check out Melodie's photo-centric post. WHY: Because it's Campaign season, we're awesome, and we can. 'Nuff said, right? HOW: Use the Linky List below to sign up as a participant. Come the week of the 24th, share your post, then hop around to the others. Simple, right? There'll even be a giveaway, featuring a critiquish prize! Feel free to grab the promo sticker for your sidebar/promotion/post! It will be fun! *crazy eyes* Promise! It sounds like fun. Let me think about it. I just have so much on my plate right now. @Lynda - Thank you! :) Aww, okay. We'll certainly miss you, but I understand. Just to clarify, I need to have posted my casting call before signing up right? Thanks again, this sounds like a lot of fun! @Jennifer - Awesome! I would definitely be interested in seeing your cast! Okay, I signed up, but not sure if I did it right, lol. I'm still trying to get the hang of this blogging stuff. :) Way excited to see everyone's pics! @Cassie - Oh, you're fine. I changed your entry from Casting Call to Reading, Writing, and Lovin' it. In this instance, your title will help things stay organized and, hopefully, promote your blog. :) Let me know if you have any more questions. I'm more than happy to help! This sounds so awesome! YOU'RE awesome. I'm going to have to give it some serious thought. This sounds like fun. I have such a hard time casting my manuscripts with anyone but who is in my head. Let me give it some thought b/c it would be a blast to join! Laila listed you in the Pay It Forward Bloghop. @Susan - Welcome! :) Hmm, maybe you could try finding location photos or things you find inspirational for that particular piece. The guidelines are pretty flexible. We'd love to have you join us! Sorry - I'm new here. So do I go ahead and sign up even though my post isn't ready yet? I just need to have it ready for the 24th? Or do I wait to sign up once it's ready? Sounds exciting! Thanks! Aahh this sounds so awesome! If I had more free time I'd totally participate! I'd love to take part in this. Let me think, and then see if I have the time to pull off something this adventurous. If not, I'll definitely hop around to see what all these talented people come up with. Not a blogfest I could enter; but certainly worthy of vast advertisement. I'll post it to my side bar and try to get an advertising post up on my blog tomorrow (10/22) for all my creative type friends. Nice to meet you Carrie. I've enjoyed browsing your site. And, its been too long since I visited Anita Grace Howard. Thanks for reminding me. Nice to meet you, too! It's always great to make new friends around here. Ooh, we are getting close!! I'm super excited to see everyone's posts! Nice to meet you! I found you through Wendy Tyler Ryan - and I'm in. I've never thought of this or tried to do this but with NaNoWriMo looming large, it'll help me get my head sorted. I'm going to borrow your badge and pop you in my side bar. Great idea--I love this. I look forward to seeing everyone's characters!! I'll try to post mine by Wednesday. GREAT IDEA! Well, it certainly took me some time to put it together, especially since I didn't see Lisa's mention of it until the day after it started having been skimping on checking my messages of late, but TADA! I finally today posted my version of the casting call over at basilsands.blogspot.com and/or www.basilsands.com. Now to go out there and check out everyone else's! Yeeey, that was so much fun! Loved the idea! Mine's finally up... under the wire! Can't wait to hop around everyone's this weekend! Thanks Carrie. This was so much fun and great to see everyone's posts! @Cassie Mae - Thank you, too! It really was fun, wasn't it? I'm glad we did it!